Open the Server Manager MMC snap-in (right-click on Computer and select the Manage option). Select the Web Server node. Look through the role services. Check for IIS 6 Management Compatability and see if it says it is installed. If not installed, click Add Role Services on right of screen. 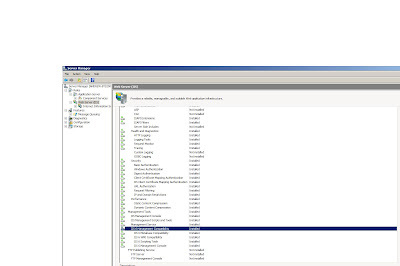 Select the IIS 6 Management Compatability and install. 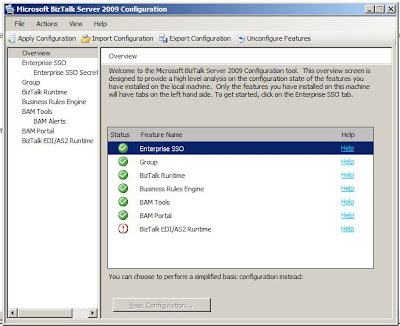 Go back to BizTalk configuration, the BAM Portal feature should now install without any issues. Thanx for this tip. Could not get BAM to work on Win2k8 until I found your post. Thanks! Your post and the power of Google SEO have saved me from yet another headache. after install the iis 6 compatability i am getting new error while configuring the BAM portal. Start registering ASP.NET scriptmap (2.0.50727) at W3SVC/1/Root/BAM. The error indicates that IIS is in 64 bit mode, while this application is a 32 bit application and thus not compatible.